In order to remain competitive, companies increasingly want to cut costs and improve operational efficiency. 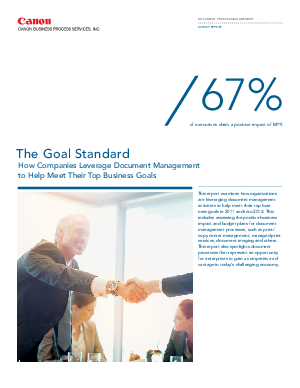 The document management activities included in this important survey report can help them reach their business goals. These activities include print/copy center management, managed print services, mail/shipping, records management and document imaging. In this survey, executives say that their companies recognize the business benefits of document management programs and are planning to maintain or increase budgets to maximize the value these solutions offer. You will receive insight into several key ways organizations are using document management best practices to help meet their most important priorities. In addition, we spotlight specific document management activities companies have implemented, the extent to which these activities are having a positive impact on the business and whether companies are managing these activities internally or on an outsourced basis and why. Lastly, you will learn about document processes that represent an opportunity for enterprises to gain a competitive advantage in today’s challenging economy.